The Russian Revolution of 1917 is also called the Bolshevik Revolution or the October Revolution. In 1917 there were actually two revolutions in Russia. 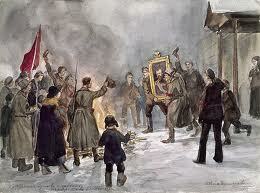 One was the February Revolution in which the Tsar abdicated his throne and the Provisional Government took power. 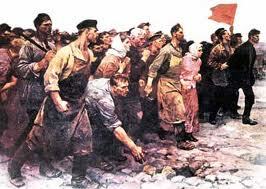 The other was the October Revolution in which the Provisional Government was overthrown by the Bolsheviks. The Russian Revolution of 1917 played a very important role in world history and also a major role in the history of the Baltic states of Estonia, Latvia, and Lithuania. Baltic peoples also played a major role in the 1917 Revolution, particularly the Latvian Bolsheviks who comprised a key portion of the Red Guards that defended the Bolsheviks at a crucial time in its early existence. One of the most startling and far-reaching results of the First World War was the Russian Revolution. Not only did it affect the largest nation on earth, it also had a huge impact on the rest of the world, helping lead to both World War II and the Cold War following it. While World War I may have triggered this Revolution, its roots go much further back into its history and geography in two ways. First of all, Russia’s flat and open terrain made it vulnerable to invasions that forced the Russian Czars to develop a strong absolutist state in self-defense. Second, Russia’s huge size, northerly location, and isolation from Europe kept Russia cut off from the mainstream of political, economic and technological developments taking place in Western Europe. Therefore, Russia’s geography and history made it a slow moving, autocratic, and backward giant that was constantly falling behind the more advanced societies in the West. This triggered a vicious cycle of reforms to catch up with the West, a conservative backlash against the reforms, Russia falling further behind the West, more reforms, and so on. Unfortunately, not all Russians felt the West was worth copying. This led to a conservative backlash that would wreck the reforms, causing Russia to fall further behind, and so on. Peter the Great in the early 1700’s, Catherine the Great in the later 1700’s, Alexander I in the early 1800’s, and Alexander II in the mid 1800’s’ all tried, or at least espoused, the cause of reform which led to conservative backlashes and the cycle repeating. That struggle is still going on in Russia today. By the 1890s Russians could no longer ignore the forces of industrialization transforming the rest of Europe and leaving it further and further behind. Therefore, reformers targeted Russia’s repressive government that used secret police to track down socialist dissidents, its backward social structure that kept the peasants in virtual, if not legal, serfdom, and its equally backward economy just starting to industrialize. Two other factors also pushed Russia toward change. One was the rising popularity of socialism. A more immediate catalyst for change was Russia’s humiliating defeat in a war with Japan (1903-5) that dramatized Russia’s backwardness. All this set off the Revolution of 1905, which took Czar Nicholas II by surprise and forced him to agree to both political and economic reforms. The main political reform was the establishment of a Duma (parliament), which attempted to turn the Czar’s absolute government into a constitutional monarchy. However, once the revolution settled down, the czar did all he could to crush and eliminate the Duma. Nevertheless, the Duma, however limited in power, persisted in being a voice for reform even as political repression reasserted itself. At the same time, substantial economic reforms were taking place. The Czar’s chief minister, Peter Stolypin, pushed through reforms that distributed land to some two million peasants. This gave peasants an incentive to produce more, and, by World War I, 75% of Russia’s crops were going to market, with 40% of those crops going abroad. This, combined with Russia’s political repression, created a gap between its economic progress and political backwardness. All that was needed was a catalyst to trigger a full-scale revolution. That catalyst was World War I.
ManyRussians, like other Europeans, greeted war jubilantly in 1914, sure that they would win a quick and glorious victory. In fact, Russia was poorly prepared for war. Its troops, although brave, were barely trained, poorly equipped (many not even having rifles), and incompetently led. Their war minister boasted of not having read a new book on military tactics in twenty-five years. As a result, Russian armies met with one disaster after another. Aggravating the situation was the Czar, Nicholas II, a weak willed man who was controlled by his wife, the Tsarina. She herself was German born and of suspect loyalty as far as many Russians were concerned. She was also under the spell of Rasputin, a drunken, semi-literate Siberian peasant posing as a monk. He did have the apparent ability to control the bleeding of the crown prince, who was a hemophiliac, along with an apparent hypnotic power over women. While scandal reigned at court (at least until Rasputin was murdered), Nicholas took personal command of the war effort, with catastrophic results. In 1917 Russia was again at war (WWI) and they were losing to the Germans mainly because they lacked the modern industry to support its war effort and didn’t have an adequate railroad system to get supplies to the front. As in 1905 when revolution broke out, confidence was not very high in the Tsar Nicholas II. The situation in Petrograd (formerly St Petersburg) was dire for most of the population. Because of the war, food supplies were low, unemployment was high, and inflation was out of control. Because of these conditions many workers became politicized and joined revolutionary organizations known as soviets. The miserable conditions coupled with 385,000 workers on strike in Petrograd led to a combustible situation. “It was the lack of bread that provided the spark to light the dry tinder of revolution, in a city whose military garrison sided with the insurgents at the crucial moment (Kirby 245). Fed up with the Tsarist regime, the workers, peasants, and soldiers rose up and demanded the redistribution of land. On February 28, 1917 Nicholas II abdicated his throne, tsarist forces surrendered, and the Tsar’s ministers were arrested. This was to be the end of the last of the tsarist regimes in Russia. Put in its place was the Provisional Government which consisted of a coalition of conservative, moderate, and liberal socialists. More specifically, the Provisional Government was made up of Mensheviks and Socialist Revolutionaries. Aleksandr F. Kerensky, the minister of justice, was one of the key people of the Provisional Government. 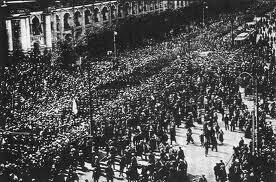 Within a few days Bolsheviks had enlisted 25,000 armed recruits to defend Petrograd. While they dug trenches and fortified the city, delegations of soldiers were sent out to talk to the advancing troops. Meetings were held and Kornilov’s troops decided not to attack Petrograd. General Krymov committed suicide and Kornilov was arrested and taken into custody. Lenin now returned to Petrograd but remained in hiding. On 25th September, Kerensky attempted to recover his left-wing support by forming a new coalition that included more Mensheviks and Socialist Revolutionaries. However, with the Bolsheviks controlling the Soviets and now able to call on 25,000 armed militia, Kerensky’s authority had been undermined. The Bolsheviks set up their headquarters in the Smolny Institute. The former girls’ convent school also housed the Petrograd Soviet. Under pressure from the nobility and industrialists, Alexander Kerensky was persuaded to take decisive action. On 22nd October he ordered the arrest of the Military Revolutionary Committee. The next day he closed down the Bolshevik newspapers and cut off the telephones to the Smolny Institute. Leon Trotsky now urged the overthrow of the Provisional Government. Lenin agreed and on the evening of 24th October, 1917, orders were given for the Bolsheviks began to occupy the railway stations, the telephone exchange and the State Bank. The following day the Red Guards surrounded the Winter Palace. Inside was most of the country’s Cabinet, although Kerensky had managed to escape from the city. On 26th October, 1917, the All-Russian Congress of Soviets met and handed over power to the Soviet Council of People’s Commissars. Vladimir Lenin was elected chairman and other appointments included Leon Trotsky (Foreign Affairs) Alexei Rykov (Internal Affairs), Anatoli Lunacharsky (Education), Alexandra Kollontai (Social Welfare), Felix Dzerzhinsky (Internal Affairs), Joseph Stalin (Nationalities), Peter Stuchka (Justice) and Vladimir Antonov-Ovseenko (War). I will cite here the most characteristic passage from a whole series of articles published in Rabochi Put by Lenin, a state criminal who is in hiding and whom we are trying to find. This state criminal has invited the proletariat and the Petrograd garrison to repeat the experience of 16-18 July, and insists upon the immediate necessity for an armed rising. Moreover, other Bolshevik leaders have taken the floor in a series of meetings, and also made an appeal to immediate insurrection. Particularly should be noticed the activity of the present president of the Petrograd Soviet, Trotsky. The policy of the Bolsheviki is demagogic and criminal, in their exploitation of the popular discontent. But there is a whole series of popular demands which have received no satisfaction up to now. The question of peace, land, and the democratization of the army ought to be stated in such a fashion that no soldier, peasant, or worker would have the least doubt that our Government is attempting, firmly and infallibly, to solve them. The Provisional Government has never violated the liberty of all citizens of the State to use their political rights. But now the Provisional Government declares, in this moment those elements of the Russian nation, those groups and parties who have dared to lift their hands against the free will of the Russian people, at the same time threatening to open the front to Germany, must be liquidated. German philosophers in the 19th century were often “Idealists,” that is, they held that ideas have a force, power, and reality that is more “real” than that concrete, reality that so consume us in our daily lives. German idealism dominated the 19th-century Russian revolutionary movement from the Decembrist Revolt of1825 until long after Lenin’s successful revolutionary coup that we call the October (or Bolshevik or Communist) Revolution of 1917. I never want to downplay the central role of raw hypocrisy in human affairs. We in the United States have seen the dissonance between the sublime humanism of Marx’s ideas and the coarse violence of the Stalinist dictatorship as rank hypocrisy. Yet, we can also see the conflict as the desperate attempt to coerce reality through the power of belief—through the power of the Idea. With this introduction, I would now like to offer three examples in the Russian Revolutionary experience where Ideas deeply affected the course of events. Only toward the end of the twentieth century have these effects begun to run out of steam. The first example involves the reaction of moderate socialists to the February Revolution in Petrograd in 1917. Moderate Socialists, including the Marxist Mensheviks in contrast to Lenin’s Bolsheviks, had adopted a position that Russia was not yet ready for a Socialist Revolution. Reading Marx’s Stages of History literally, they understood the Bourgeois Revolution had to come first and had to take place under the leadership of the bourgeoisie. The working-class movement thus had to satisfy itself with playing the role of a party of the extreme opposition. The bourgeois revolution had to come first and be developed. The responsibility of the proletariat was to encourage this historical necessity. Real consequences flowed from this belief. When the women, workers, and soldiers of Petrograd spontaneously took to the streets in February 1917, it took only several days for them to overthrow the 300-year-old Romanov dynasty. They then handed power they had won in the streets to their moderate socialist leadership—none of whom were philosophically or psychologically ready to assume the mantle of power. Consistent with their beliefs, the socialists in turn handed power to the bourgeoisie who set up the Provisional Government. Not having the complete courage of their convictions, however, the moderate socialists also created the Petrograd Soviet. This organization held veto-power over the actions of the bourgeois Provisional Government. This “compromise” established the period of “Dual Power” which was inherently unstable. In retrospect, it is amazing that the Provisional Government, amidst the catastrophe of World War I, managed to hold on to power until October of 1917 when Lenin’s and Trotsky’s Bolsheviks managed a coup d’etat to take power. Lenin, like his Menshevik cousins, was a Marxist, but his Marxism focused less on the determinist element of Marx’s Stages of History than on the ability of the individual to assert his will on history. For him, there was no need to wait patiently for the bourgeoisie to fulfill their historical duty at their own leisure; Bolshevism could force the pace. Lenin’s Will to Power and his belief in the power of the Idea to change reality made the difference between his success and the moderate socialists’ failure. The second example of the power of the Idea concerns Soviet influence on the developing world. Lenin wrote Imperialism, the Highest Stage of Capitalism in 1917, during the trials of the First World War and before the Bolshevik Revolution, to explain two crucial contradictions facing Marxists of the day. The first contradiction concerned the delayed outbreak of the promised world revolution. After all, it had already been sixty-nine years since Marx in the Communist Manifesto had proclaimed that “A Specter is haunting Europe—the specter of Communism.” What had gone wrong? Lenin’s ingenious answer to both questions came in his book, Imperialism: The Highest Stage of Capitalism. In it, he argued that the concentration of production had transformed the capitalism of free competition into monopoly capitalism. The concentration of production also had dramatically increased the socialization ofproduction. Big banks had changed from pure credit institutions into business banks and dominated whole sectors of industry. Together, the banks and industry built ties with government. This coalescence of bank capital with industrial capital with strong government ties had formed a financial oligarchy that controlled large sections of the national economy. The final example of the power of ideas generated during World War I involves the intimate, kissing cousin-relationship between Stalinist Communism and Mussolini’s Fascism. Fascism was the heir of a long intellectual tradition that found its origins in the ambiguous legacy left to revolutionaries in the work of Karl Marx and Friedrich Engels. Fascism was, in a clear and significant sense, a Marxist heresy. It was a Marxism creatively developed to respond to the specific needs of an economically retarded national community condemned, as a proletarian nation, to compete with the more advanced plutocracies of its time for space, resources, and international stature. Was this self-awareness present as thinkers and politicians struggled to define these two ideologies as they co-developed earlier in this century? In fact, many did recognize that their common interests held much greater weight than did the Talmudic differences between Fascism and Communism. Arturo Labriola’s Avanguardia Socialista of Milan by 1903 had become the forum for Italy’s Sorelian syndicalist revolutionaries, who were struggling to make Marx relevant and against reformist socialism. Such luminaries as Vilfredo Pareto and Benedetto Croce graced its pages, followed shortly by a second generation of Sorelian theoreticians, who came to dominate Italian radicalism for more than a generation. Together they constructed an alternative socialist orthodoxy, which they believed was the true heir to classical Marxism. Clearly, their ideas were no more heretical to those of Karl Marx and Friedrich Engels than was Lenin’s Marxism. By 1904 Mussolini, then a socialist agitator in Switzerland, had begun his collaboration with Avanguardia Socialista, a relationship he kept for the next five years. The syndicalist contributors to the journal affected the future Duce’s intellectual and political development. Radical syndicalists like A. O. Olivetti innovatively argued that, under retarded economic conditions, socialists must appeal to national sentiment if their ideas are to penetrate the masses. For him, both syndicalism and nationalism were dedicated to increasing production dramatically. As long as Italy remained underdeveloped, the bourgeoisie remained necessary to build the economic foundation requisite for a socialist revolution. Olivetti spoke of a national socialism, because in an underdeveloped economy, only the nation could pursue the economic development presupposed by classical Marxism. When Mussolini took over as editor of the socialist paper, Avanti!, in December 1912, he attracted anarchists and even some rigid Marxists like Angelica Balabanoff, whom he took on as his assistant editor. Paolo Orano, who served on the editorial staff of Avanti! with other syndicalists like Sergio Panunzio, set the tone of that socialist paper. Mussolini also founded and edited Utopia from November 1913 until December of the following year. This bi-monthly review attracted many of the most important young socialist and syndicalist theoreticians, who helped Mussolini to develop his own ideas. In the final years before the First World War, many independent national syndicalists, including Panunzio and Ottavio Dinale saw war as progressive. Helping to put together the rationale for Fascism, they supported Italy’s fight with the Ottomans over Libya in 1911, and, with Mussolini, they called for Italy’s intervention in the First World War. Many socialists now passed into Mussolini’s Fascist ranks, and syndicalists such as Panunzio, Olivetti, and Orano, became its principal ideologues. As early as October 1914, Olivetti in Pagine Libere spoke of an Italian socialism infused with national sentiment, a socialism destined to complete Italy’s unification, to accelerate production, and to place it among the world’s advanced nations. Over the next three years in L’Italia Nostra, Olivetti spoke of the nation as uniting men of all classes in a common pursuit of historical tasks. Class membership did not align an individual against the nation, but united him with the nation. Patriotism was fully compatible with the revolutionary tradition of Italian socialism. I have presented three diverse examples of the impact of the Russian Revolution on later history. There are other potential examples. I find it interesting that events so important to the twentieth century, now are rapidly fading in their influence. One real benefit of examining the Communist Revolution within the larger question of “how best to develop” is that the Revolution loses its sense of seminal criticality. For all the pathos surrounding the effort, it becomes just another interesting attempt at rapid development—a failed attempt at that. While I would happily argue that Marx still has relevance for us today, especially in his critique of capitalism if not particularly in his solutions, clearly Lenin and Stalin no longer do. When the year is not indicated in the reference, the term “Russian Revolution”, if used as a time mark, usually refers to the October Revolution of 1917, whereas references to the revolution of 1905 always mention the year and references to the February Revolution always mention the month.